The biobased and circular economy is coming nearer and nearer. Each year, new applications of biobased resources come to the market. Industry aims at using the whole crop, among others by valorisation of what used to be called waste streams. Fibres play an important role in this process, says Michiel Adriaanse of the Dutch Development Centre for Paper and Board (KCPK). Tomato tray from tomato stem fibres. Source: Solidus Solutions. Industry increasingly recognises the value of local feedstock. Tomato plant stems are a well-known example. In greenhouses, the life span of tomato plants is about one year; then they need to be replaced. The traditional way of processing is composting; horticulturalists have to pay for removal and processing. They can save that money if they process the whole crop. 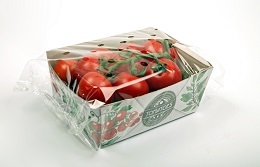 Schut Papier processes stems to distinctive offset paper, and Solidus Solutions produces tomato trays from them. The most successful strategy is to use the trays for display in supermarkets: customers value the sustainable provenance, but in B2B markets this kind of packaging carries little premium value. We see the same effect in egg packaging. Huthamaki recently started producing egg trays for the B2C market, 50% from grass fibre. The success surpasses all expectations, at present the producer cannot even meet demand. Grass is an interesting local resource. Much grass ends up being composted – why not develop better applications for the fibres, like packaging materials? We find another application of local resources in the Dutch province of Zeeland, where local authorities grow miscanthus on a temporarily fallow area. Initiatives with miscanthus abound ; the crop grows unbelievably fast, on each substrate, almost without any maintenance. For instance, one farmer panted miscanthus and Van Houtum processes it to hygienic paper. And we also wrote about the special properties of the hemp fibre: so strong that hemp would make a good substitute for cotton in bank notes. 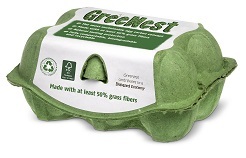 Egg tray, 50% grass fibres. Source: GreeNest. Better recycling improves whole crop valorisation even more. A well-known problem is recycling of laminate packages (milk or drink cartons); these are made from layers of paper and plastic, some also with aluminium. In paper recycling, the majority of these laminates end up in a rest stream, the so-called rejects. With modern technology, industry increasingly succeeds in successfully processing this side stream. Smurfit Kappa Roermond Papier removes metals and water and supplies the remainder to energy producers. ESKA in Hoogezand uses Leroux & Lotz technology for gasification. Alucha developed a process for rejects and paper sludge recycling, based on Twente University’s pyrolysis technology. In this process, pyrolysis is not used to produce fuels, but as a separation technology. At a very precisely adjusted temperature, the organic component (plastics in laminate, fibres in paper sludge) transforms to oil. They can then separate the inorganic component (metals and fillers, respectively) for reuse. Mineral fillers (mainly carbonate) can be reused in the paper industry itself (100% circularity) or in construction. Alucha operates the laminate process in Barcelona, the sludge process is still in a pilot. The paper industry also increasingly valorises waste water. Paques has been selling for over a decade now its process for biomethane production from paper and board industry’s waste water; this saves 8-10% of natural gas requirements. A number of Dutch companies (Paques, Opure and others) develop PHA production from process water. And the Royal Haskoning ‘Nereda’ purification technology produces alginate from process water. The paper and board industry uses alginate as a vapour barrier and for water capturing. And the range of opportunities for valorising the whole crop keeps on extending. For instance, an increasing number of technologies comes to the market for valorising (cellulosic) fibres to micro cellulose. Its application has a huge potential (also in the paper industry) but this requires much development work. The circular and biobased economy is coming nearer and nearer!